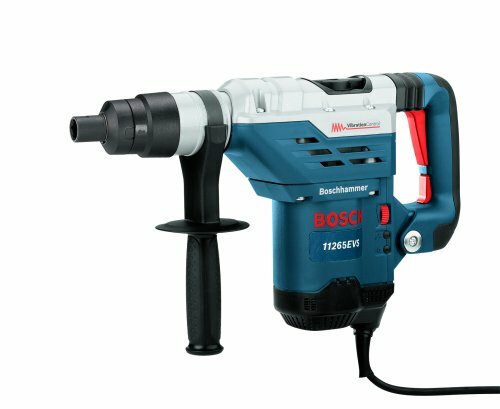 Bosch 11265EVS 1-5/8 Spline Combination Hammer by Bosch at N Online Agency. MPN: 11265EVS. Hurry! Limited time offer. Offer valid only while supplies last. 114-11265EVS Features: -Combination dual mode selector. -Innovative service modules. -Integral clutch helps minimize torque reaction. -Vario-Lock? 114-11265EVS Features: -Combination dual mode selector. -Innovative service modules. -Integral clutch helps minimize torque reaction. -Vario-Lock? Positioning, rotates and locks chisel into 12 different positions. Product Type: -Demolition Hammers. Max Blows/Minute: -2900. Generic Specifications: -Voltage: 120.00 VAC. -Cycle Rate: 1700 blows/min [Min], 3 blows/min [Max]. Dimensions: Overall Width - Side to Side: -16.5 Inches. Overall Depth - Front to Back: -18 Inches. Overall Product Weight: -15.1 Pounds. Auto-max speed dial - ensures maximum speed every time the tool is turned on.